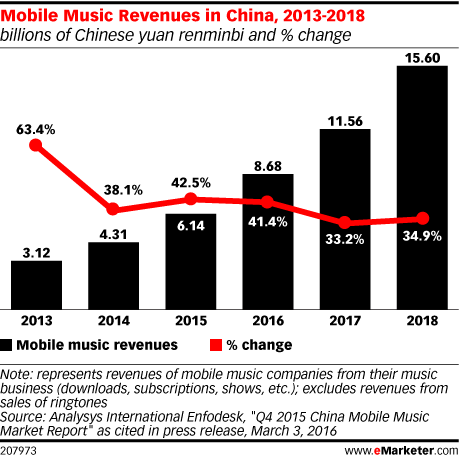 There’s big growth in mobile music revenues in China, according to one forecast, which estimates that after 42.5% revenue growth last year, 2016 earnings will be up a further 41.4%. The audience is also on the rise. An April 2016 report found that there were 97.4 million pay TV subscriptions in 2015, a figure set to rise to 104.3 million in 2021. Household penetration is also going up. Americans are spending more time watching digital video on their computers and smartphones, while spending less watching traditional TV. However, according to eMarketer’s latest forecast on time spent with media, traditional TV still captures the lion’s share of Americans’ video-based attention every day, as well as most video ad dollars. In Q4 2014 the region had 3.3 million pay TV subscriptions, which rose to 3.7 million subscriptions in Q4 2015—a positive change of 13.5%, and reason to believe there is room for market expansion. Digital cable TV revenues will skyrocket to $5.3 billion in 2021, up from 2016's projected revenue of $3.5 billion. Demand for virtual reality (VR) devices in China remains small for the time being, with the total user base in the country expected to be less than 10 million individuals through 2018. Despite this relatively early stage of adoption, enthusiasm for the potential digital video and gaming applications of VR may help to ramp up interest. Mexico leads Latin America when it comes to pay TV subscriptions, with more than 19 million in Q3 2015. That is nearly one-fourth of all Latin American pay TV subscriptions. Uwe Ellinghaus, CMO of Cadillac, discusses the new iteration of the automaker's "Dare Greatly" campaign, featuring young innovators, which was unveiled during the 88th Academy Awards. 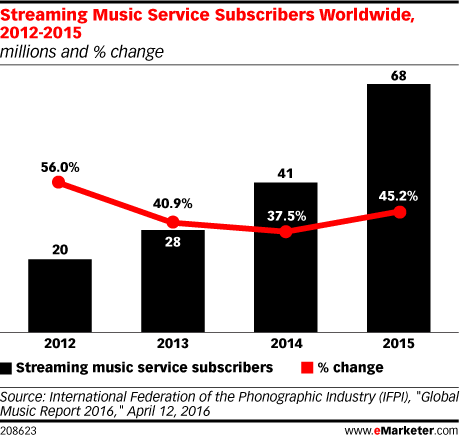 IFPI estimated that there were 68 million streaming music service subscribers in 2015, a growth rate of 45.2% from 2014’s 41 million. 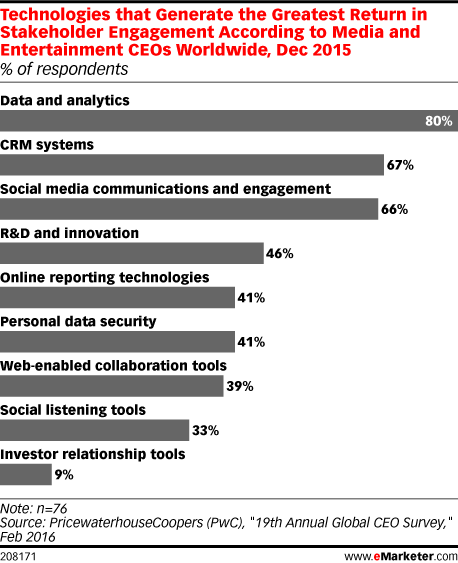 Technologies that track and support overall data, customer relationships and social media interactions brought about the best return in stakeholder engagement, according to media and entertainment CEOs. Nearly a third of digital gamers in Brazil are ages 16 to 24, while those ages 25 to 34 make up the largest group of gamers in the country at 34.8%. Overall, three in four internet users play video games, and smartphones are the most popular device for playing. Though US internet users are interested in virtual reality and experiencing different types of content via the technology, February 2016 research found that most users worldwide are not interested in purchasing a VR headset. The digital TV audience in Australia appears to be somewhat mature, according to 2015 research. The gender and age breakdowns of the audience are stable, and penetration is not changing much. The TV and video viewing landscape in the UK has changed dramatically in the past 10 years. But even as digital video consumption comes to the fore, certain ingrained habits continue to influence the shape of the market, with traditional TV playing a central role in ushering in digital video services. Moti Cohen, founder and CEO at Apester, a global provider of interactive content platforms, talks about viewing habits in the UK and how millennials are changing the consumption game.